Diffusion is the net movement of particles from a region of higher concentration to a region of lower concentration. Diffusion is a spontaneous process (no input of energy required). It can also be called as a passive process. Substances tend to spread from an area where they are more concentrated to an area where they are less concentrated. Firstly, what is a concentration? Concentration is the amount of substance (in mass) divided by it's volume (in litres). In other words, a measure of the amount of a substance in a specific volume. 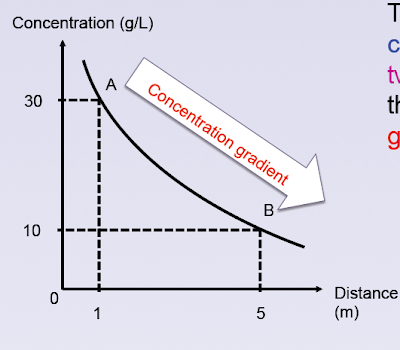 So, what is concentration gradient? The concentration gradient is the change in concentration between two regions. From the graph, we can also say that difference in the concentration between points A and B is the concentration gradient between points A and B. If the above graph shows the concentration of sugar at points A and B, sugar molecules will diffuse down the concentration gradient from point A to point B.
Firstly, particles diffuse down the concentration gradient. The larger the concentration gradient, the faster the rate of diffusion. Hello! I am Natasha Tai from Raffles Girls School (Secondary), Singapore. I am in secondary 3 this year. My blogs are based on my academic tasks and projects in school (from secondary 1 to 3). Hope you'll find my blog posts useful!